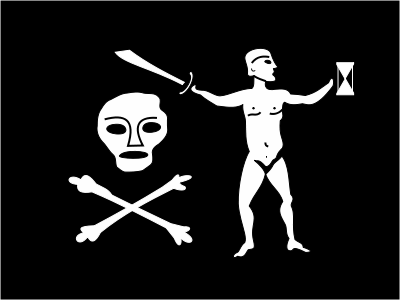 In 1984, “Black Sam” Bellamy became New England’s most famous pirate when Barry Clifford discovered the wreck of Bellamy’s ship Whydah off the coast of Cape Cod. Today, one can go to a museum and see some of the material salvaged from the wreck. But who was Bellamy, and what can his story tell us? In brief, Samuel Bellamy was born in 1689, tried to salvage treasure from the wrecked Spanish treasure fleet of 1715, and when he had little success at that, turned pirate. In February, 1717, he captured the Whydah, a newly-built slave ship, while sailing in the Caribbean. Subsequently he headed up the coast. 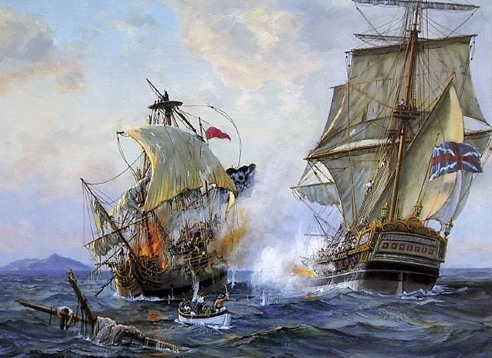 Late in the evening of April 26, 1717, the Whydah was caught in a thunderstorm and driven onto the reefs, where the ship broke up, with the loss of all but two hands. Bellamy himself perished, along with 143 crewmen. As such, it’s not that interesting a story, and it’s not surprising that Capt. Charles Johnson didn’t get to it until the second volume of A General History of the Robberies and Murders of the Most Notorious Pirates in 1728. And he probably got his information from two newspaper accounts and a sermon printed in 1717. However, Johnson wasn’t above embellishing the accounts to make a political point or two. Typically, Johnson embellished to establish the criminal nature of the pirates and how their sins contributed to their downfall. That explains his probably fictional account of Avery’s (Every’s) downfall. But sporadically through his work, Johnson had pirates speak out against the established social order and its injustices. He even invented a pirate captain named Misson to show what a utopia based on reason, justice, and mercy might look like. Johnson wrote his account of Bellamy along the latter lines. Twice he related speeches in which he suggested that states are founded by force of arms and therefore have no more moral authority than any pirate! He had Bellamy declare at one point that “I am a free prince, and I have as much authority to make war on the whole world, as he who has one hundred sail of ships at sea, and an army of 100,000 men in the field . . .” What’s curious is that while Johnson probably made up one of the speeches out of whole cloth, the one I’ve quoted has a factual basis, as it was taken from the account of a ship captain robbed by Bellamy and his crew! Bellamy’s and Hallett’s romance still pulls in readers, as this 2010 book demonstrates. Nor was Johnson the only person to embellish Bellamy’s life. 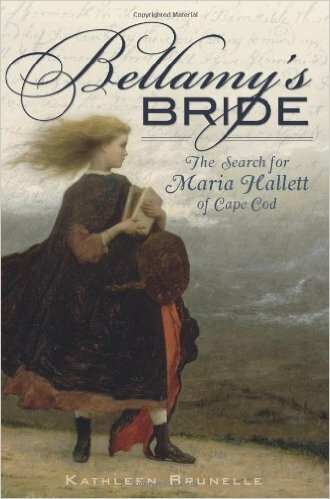 There is a possibility that Bellamy was sailing by Cape Cod in order to rekindle a romance with a young woman, Mary Hallett, who lived on the Cape. According to legend, he had met and romanced Mary on a previous visit, and even promised marriage. Mary succumbed to his charms, he sailed off, and she found herself pregnant. She hid her pregnancy, but was exposed when her dead child was discovered. Depending on which version of the story you hear, either she went mad pining away for her missing love, she became a witch and caused the storm that wrecked him, or he escaped the wreck of the Whydah, and the two ran off to have a happy life together. All of which suggests that a legend has overtaken the facts. There was a young Mary Hallett living in Eastham in that era, but the rest is legend, and she died decades later, unmarried. Strangely, Johnson had little to say about the wealth Bellamy’s crew discovered when they took the Whydah: “elephants’ teeth, gold dust, and other rich merchandise.” Later historians added “sugar, indigo [used for dying] and Jesuit’s bark [used in the treatment of malaria].” The money on board was reported to run to £20,000, or £30,000, portioned out in 50-pound bags. 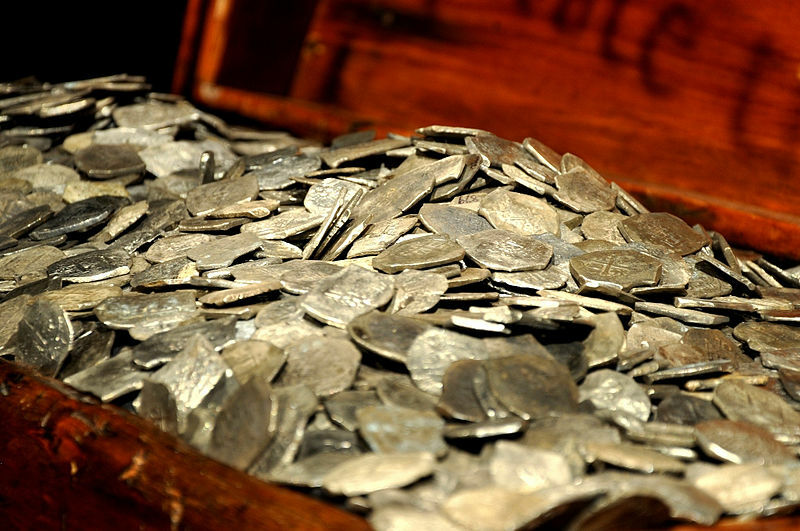 If true, then the Whydah had 4.5 tons of gold and silver money on board. By some estimates, that would make Bellamy and his crew the richest pirates in history. This entry was posted in Pirates, U. S. history and tagged Barry Clifford, Black Sam Bellamy, Cape Cod, Captain Charles Johnson, piracy, pirates, Samuel Bellamy, Whydah on February 5, 2017 by Brian Bixby. The pirate crew thinks their captain has screwed up. So how do they get rid of him? Well, if you read Robert Louis Stevenson’s Treasure Island, they slip him the black spot, a piece of paper marked black on one side, and the crew’s decision on the other. Late in the novel, the pirates want to depose Long John Silver as captain, but they’re a little short of paper. So they cut out a round spot from the last page of a Bible one of the pirates carries! It’s a great story, but there’s no truth to it. Stevenson probably made it up himself. Which raises the question of just how did a pirate crew in the Golden Age of Piracy deal with an unsatisfactory captain. Oh, Stevenson has the right of it in one respect. There really was a commonly understood procedure to deal with complaints about the captain. Which is not to say it was always followed. Let’s follow one instance where it was done right. 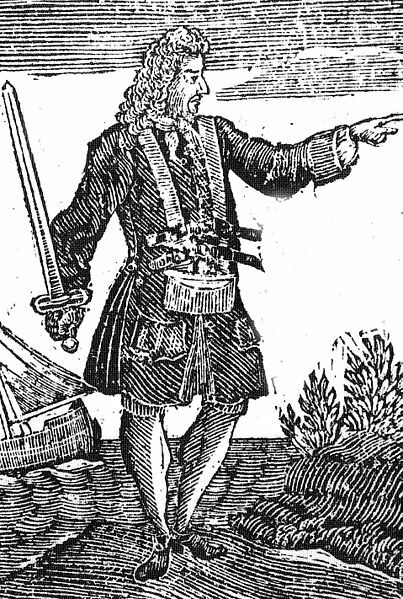 Charles Vane was one of the red hots among the pirates who wouldn’t accept the King’s Pardon in August, 1718. He recruited a crew of other red hots who didn’t want to give up piracy, gathered them in his ship, the Ranger, and sailed out of New Providence harbor. Oh, and he used a fireship to try to burn up the Royal Navy ships in the harbor as he left. He failed, but what brass! Clearly Vane was a daring pirate captain. Vane knew that the best way to keep his crew happy was to take as many prizes as possible. That way they’d have enough food and drink. And if they got lucky, they might capture a ship with a lot of gold and silver on board. They did well enough for a while. But then Vane lost a prize when the pirates crewing it went off on their own, and spent a month heading south without taking a single ship. The crew grumbled. On November 23, Vane saw a ship, pursued it, and ran up the pirate colors. 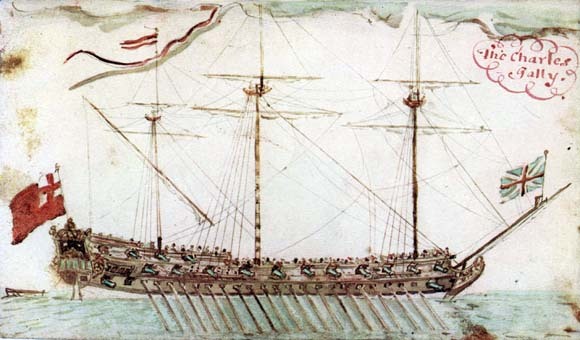 Instead of surrendering, the other vessel raised the French colors and let loose a broadside. It was a French Navy ship! Vane decided the best course was to get away, as fast as he possibly could. It was probably the right decision. It was suicidal for pirates to engage a navy ship most of the time. The navy’s professionalism and strict discipline usually gave them an edge, even against pirate ships mounting more guns. This was so well understood that when “Black Bart” Roberts, one of the most successful pirates of that era, found himself trapped and forced to fight a Royal Navy ship, he tried his best to run past it in a storm. And even then, he thought it so likely he’d be defeated that he gave orders to try to run the ship aground to let the crew escape should they not evade the warship. The Navy ship Vane confronted actually outgunned his ship. So Vane was very wise to turn heels and run rather than engage the ship. But for some reason the crew didn’t see it that way. Maybe they’d seized so little loot they were desperate. Maybe they were drunk and foolhardy. But they wanted to fight that Navy ship, and they loudly told Vane as much. However, it was a rule that in times of combat or chase, a pirate captain’s authority was absolute. Vane invoked that rule, and the pirates had no choice but to comply, then. A pirate captain’s authority counted for nothing once the ship was not in a combat situation. Instead, the quartermaster became the most powerful officer. Originally the officer responsible for keeping track of supplies and sharing out the loot, the quartermaster had become a sort of crew’s tribune, responsible for presenting the crew’s concerns to the captain. On board the Ranger, the quartermaster was “Calico Jack” Rackam. Rackam called the crew and captain together the very next day, explained that the crew was dissatisfied with Vane’s performance, and called for a vote to label Vane a coward and depose him. The majority so voted, and Vane was deposed. And that was that. Well, except for the question of who would be the next captain. The most obvious choice was the other major officer, the quartermaster. And that’s how Calico Jack Rackam became captain of the Ranger. And there was the little problem of what to do with Vane. Pirates might often be drunk and illiterate, but they weren’t incredibly stupid. They realized that a man might not enjoy losing his position as captain, and might intrigue with his loyal followers to retake command. So the usual procedure was to get rid of the captain somehow. In Vane’s case, they had a prize, a small sloop, accompanying the Ranger. They gave the sloop to Vane and the handful of crewmen who were loyal to him, and the two pirate ships went their separate ways. 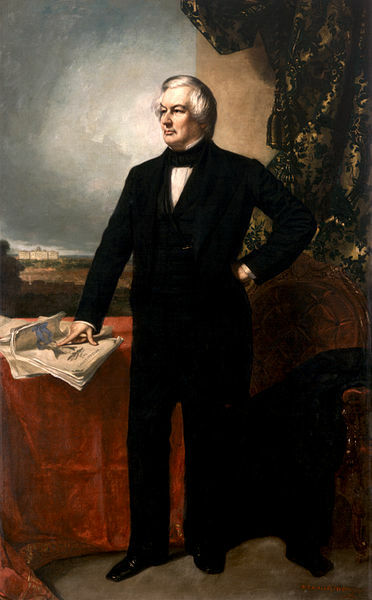 Weird fact: One of the “forced” men who overthrew Phillips was President Millard Fillmore’s great-grandfather! That was the right way to do things. Even so, Vane was relatively lucky. Sometimes ex-captains were put off in a small boat, as Henry Every did to the legitimate captain of the vessel he seized to turn pirate back in 1694. Or he might be marooned on a small island, as Edward England was after he was deposed for being too kind to a merchant captain in 1720. Or, worse yet, he could be killed, as John Phillips was in 1724. Although perhaps the last example is unfair: Phillips was killed when the “forced” men (men who had been forced to join the pirates from legitimate ships) rose up and took over the vessel to end their piratical career. Hardly a voting situation! Vane’s fate points to another way pirates broke with their captain, or sometimes vice versa. Pirates would sometimes keep ships they had taken, and split their numbers across two or more ships. Usually each ship would have its own captain, but the senior captain would have authority over all of them. Black Bart Roberts styled himself as “Admiral” and had as many as four ships under his command at one time. In practice, this was a recipe for dissension. It was natural for the overall commander to favor his own ship, and the captains of the other ships were often tempted to sneak away during the night or during a storm to strike out on their own. It happened at least twice to Roberts. Indeed, it was after Walter Kennedy made off with a ship in 1719 that Roberts drew up his articles which expressly forbade desertion. At least once, the trick was turned the other way. Blackbeard commanded a fleet of four ships in 1718, and they had accumulated a nice amount of loot. Blackbeard decided to cut most of his pirates out of their share. So he ran his two largest ships aground as if by accident. He sent off one of the other captains, Stede Bonnet, on pretext of securing a pardon, transferred all the loot into the smaller of his two remaining vessels, stripped the other one of its ship stores, and then sailed off with his favorite crew, leaving over 200 pirates stranded behind. So much for pirate honor! Then of course there were the other ways to end a captain’s rule. He could drown in a shipwreck, as Samuel Bellamy did off Cape Cod in 1717. Or he could die in combat when his ship was attacked, as happened to Blackbeard in 1718 or Roberts in 1722. 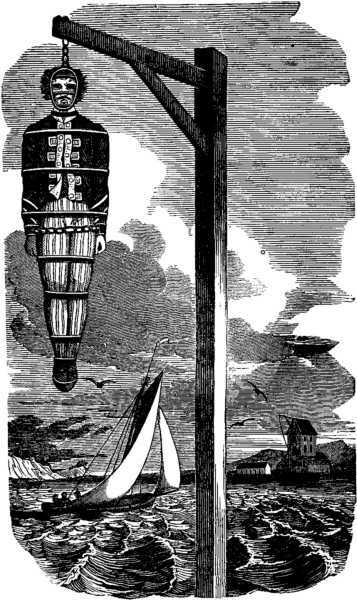 Or he could be hanged after he has been captured and brought to trial, as happened with Captain Kidd in 1700, and both Vane and Rackam in 1720. This entry was posted in Pirates and tagged Black Sam Bellamy, black spot, Blackbeard, Calico Jack Rackam, Charles Vane, Henry Every, history, piracy, pirates, Samuel Bellamy, Treasure Island, Whydah on July 10, 2015 by Brian Bixby. In the early morning hours of April 26, 1717, Samuel “Black Sam” Bellamy, pirate commodore, died along with most of his crew when his ship, the Whydah, ran aground and broke up in a storm off Cape Cod, Massachusetts. 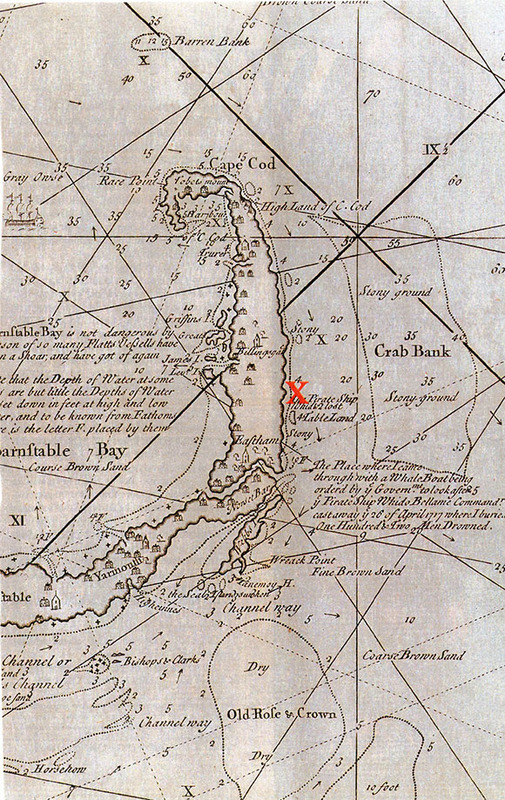 In 1984, Barry Clifford found what remained of the wreck of the Whydah. It was the first pirate ship wreck from the “Golden Age of Piracy” to be discovered, and the first to have some of its treasures recovered. 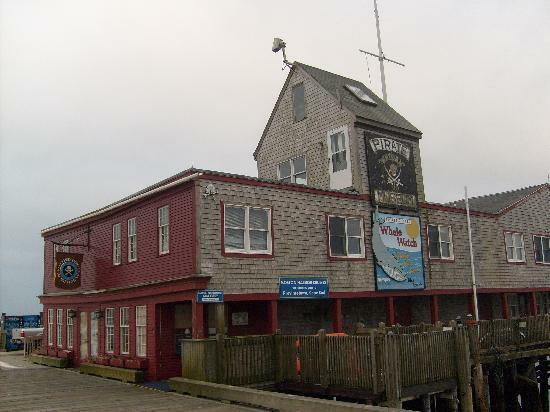 Clifford set up a museum on the wharf in Provincetown on the Cape to exhibit some of the recovered objects from the ship and to explain their significance. That’s where I went on August 12. Cape Cod is a summer tourist spot, and its space and economy are structured accordingly. The south coast of the upper Cape is for kitschy family entertainment. I’d never seen a mini-golf course with multiple waterfalls, at least one 20 feet high, until we hit route 28 east of Hyannis. The north coast of the upper Cape is by contrast more rural and a bit quieter. The east coast of the lower Cape is enveloped by the National Seashore (the first one established), which keeps that stretch of the coast relatively unspoiled. There’s only one main road running the length of the lower Cape, and it tends to drop and add lanes seemingly at random. Expect to get caught in at least one traffic jam if you travel to the lower Cape in the summer. And that includes Provincetown, where the museum is. There’s a ferry from Boston to Provincetown, which sits at the very end of the Cape; it’s an alternative, albeit an expensive one, to driving there. The Whydah Museum sits on the same wharf as the ferry to Boston. I gather Clifford wanted to set it up elsewhere (Boston and Tampa were floated as possible sites), and still plans to build a bigger and more permanent museum. So this museum is a small one. Still, you can spend a few hours in it, if you watch the video, read the material posted on the walls, and examine the exhibits with some care. The exhibits and the information posted on the walls are structured as self-contained modules, which can be examined in any order. That probably makes the museum easier to visit when it is crowded; one can skip from one display to another and eventually cover the whole museum without losing the thread of the story. On the other hand, it means there really isn’t a single story line running through most of the exhibits. If you don’t know who Bellamy was or have any other context to understand the exhibits, then definitely watch the introductory video. Otherwise you’ll be seeing a lot of information that you won’t be able to pull together unless you have an eidetic memory. On the positive side, nowhere else (with one exception, see below) can you see exhibits from an actual pirate wreck, whether silver coins, cannonballs, or even the ship’s bell. And one of the three “rooms” of exhibits covers Clifford’s most recent project, to salvage the remains of a pirate ship that went down near Madagascar in the Indian Ocean. On the negative side, if you want to get a solid understanding of the Golden Age of Piracy, read a book instead. The information displays in the museum only cover some aspects of the subject, and doesn’t pull the pieces together. Oh, the other place you can see exhibits from an actual pirate wreck? 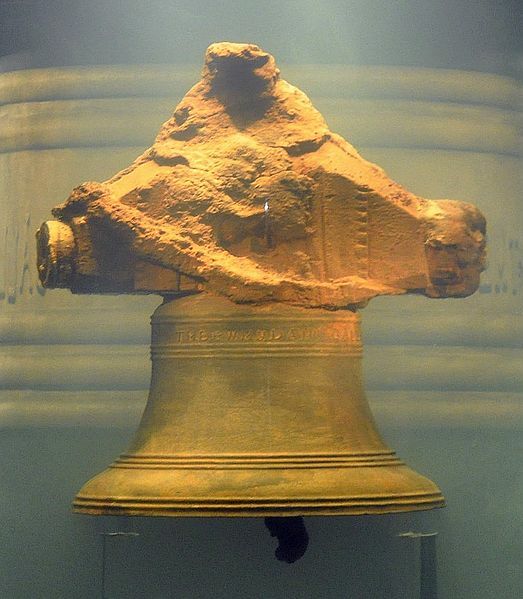 Some of the Whydah exhibits are on tour, including the famous ship’s bell. Catch it on tour, or wait until it returns, if you have your heart set on seeing the object that proved Clifford had found the Whydah. This entry was posted in Pirates and tagged Barry Clifford, Black Sam Bellamy, Cape Cod, museum, piracy, pirates, Provincetown, Samuel Bellamy, Whydah, Whydah Pirate Museum on August 17, 2014 by Brian Bixby.